Going green in the laundry room is super easy everyday! 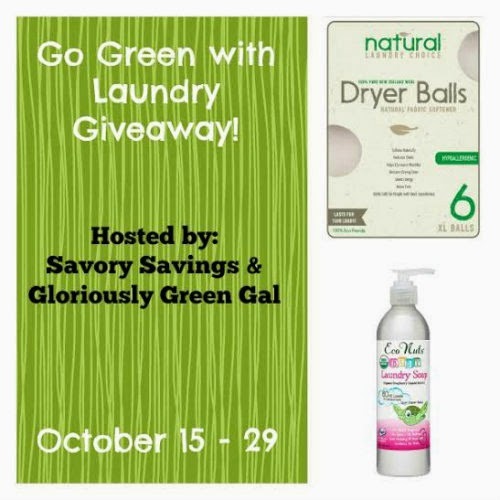 Krista over at Savory Savings and Gloriously Green Gal couldn't wait to ramp up her green in the laundry room with Eco Nuts Laundry Soap and Natural Choice Laundry Wool Dryer Balls! Swing on over and take a peek at her reviews to see just how easy it can be to add an eco-friendly touch to your laundry day! Wouldn't it be awesome if you could win an Eco Nuts natural laundry soap as well as Natural Choice Wool Dryer balls? Here's your chance! Simply enter using the Giveaway Tool below. Please note that if you've won a Natural Choice or Eco Nuts giveaway anytime from ANY other blog in the last 12 months, you are NOT eligible to win this giveaway. This giveaway will run from October 15 through October 29, 2014 at 11 PM CST and is open to US residents, ages 18 and older. Entries will be verified. Winners will be notified via email (consider adding gloriouslygreengal@gmail.com to your safe list) – winner will have 48 hours to respond and claim prize or another winner will be selected.